Location: Any familiar location, such as the house, yard or regular training area. All exercises off leash. Equipment: Retrieve object, high or bar jump, scent articles (x6), glove. Cues: Cues may be verbal and/or signal unless specified differently in the described exercise. 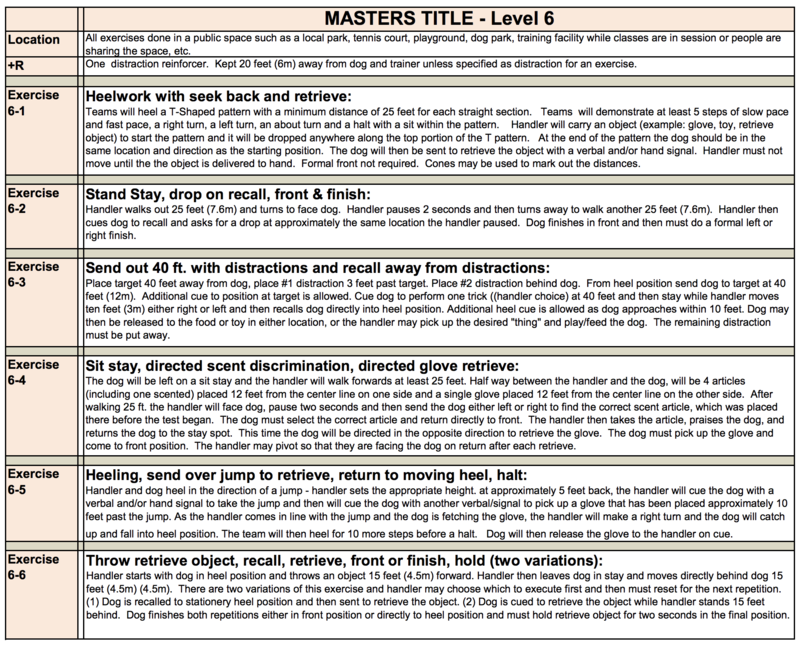 Reinforcement: Two distraction reinforcers (only one will be given), located off handler’s body. Reinforcers must be located within the video testing area. The reinforcer MUST be the same food or toy that is used in any distraction work. One reinforcer = one food reward OR ball toss/toy play up to 10 seconds. Maximum video length: 10 minutes. Note: This video is of a Level 6 Honors submission. Heelwork with send (seek back), search and retrieve. Team will heel a T-shaped pattern, which includes change of pace while handler drops an object. 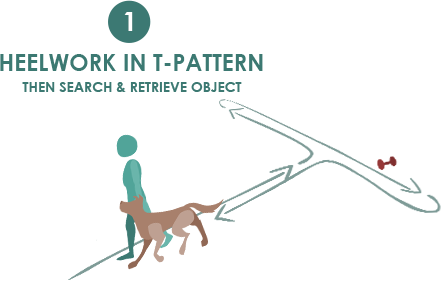 Upon returning to the starting point, the dog will be sent to retrieve the object (and search for it, if necessary), and deliver object to handler. Stand/stay, drop on recall, front or finish. Handler leaves dog in a stand/stay, walks away, then cues a drop on recall, followed by front or finish. Send out 40 ft. (12 m), perform trick, and recall with distractions and handler movement. Handler places distractions beyond send-out point, and behind dog. 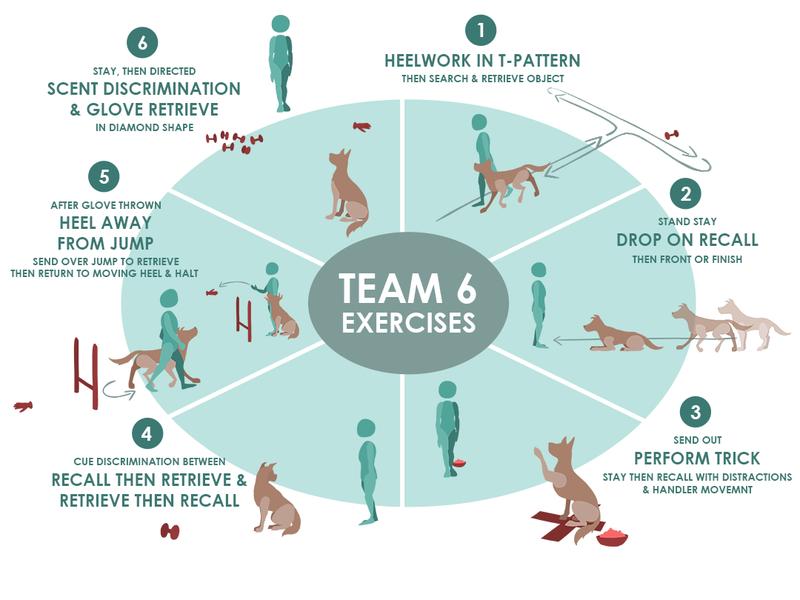 Handler cues dog to target, then cues a trick (see Rules & Judging section for definition), followed by handler movement before calling the dog back to front or heel position. Throw retrieve object, recall, retrieve, front or finish, hold (two different repetitions). 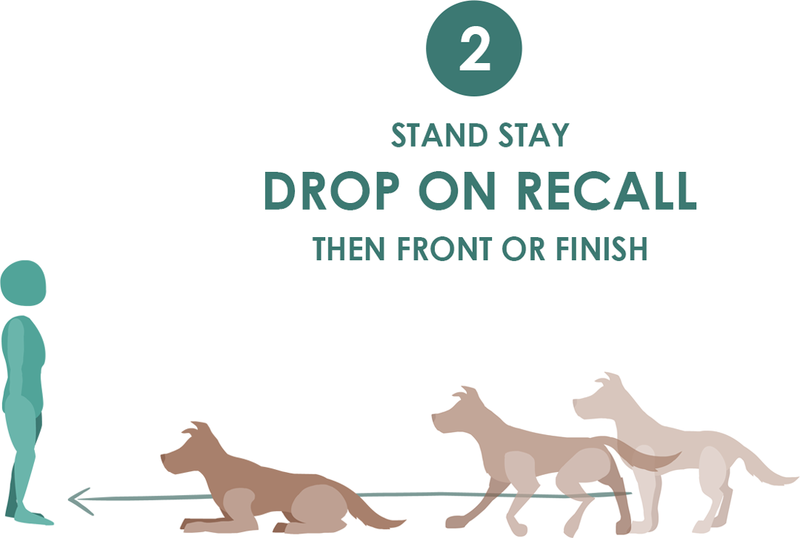 Handler will throw a retrieve object, move directly behind the dog and either recalls the dog first and then sends for the retrieve, or dog is cued to retrieve object while handler stands behind dog. Both repetitions require a 2-second hold and return to handler in front or heel position. Heeling, send over jump to retrieve, return to moving heel, halt. 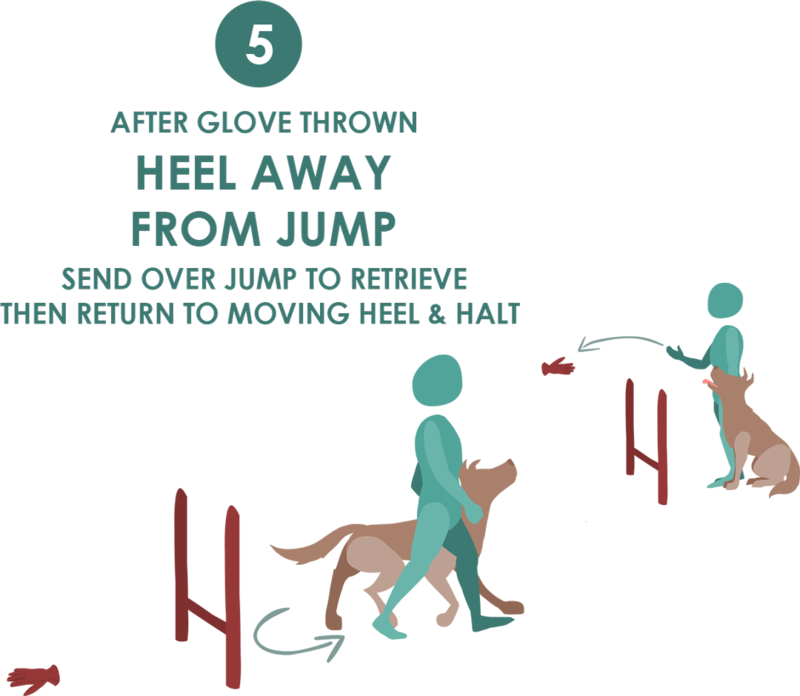 Handler throws a glove over a high/bar jump, heels with the dog before sending the dog to retrieve the glove, after which the dog catches up to handler and continues to heel before handler takes glove. The dog will be left in a stay, in any position, while the handler sets up for this exercise. 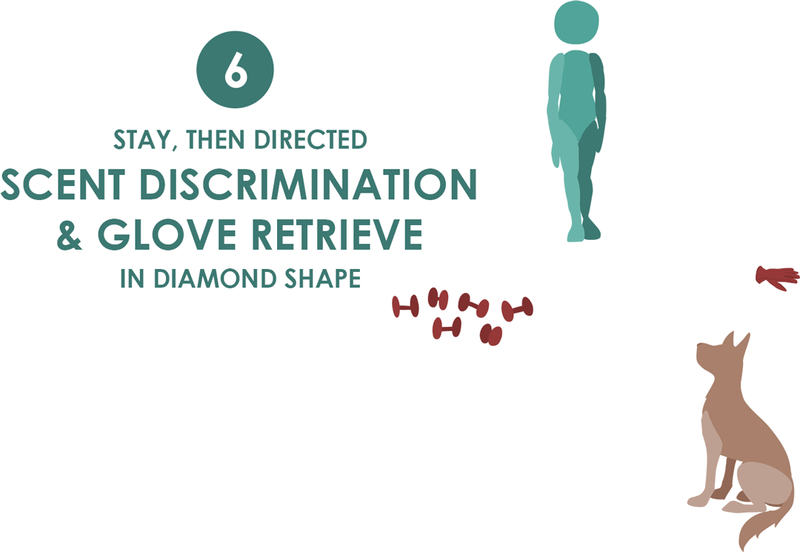 Six articles (including one scented) and a single glove are placed in opposite directions. Dog finds the correct scented article and returns it to handler, then retrieves the glove and delivers it to handler.